SAN FRANCISCO--(BUSINESS WIRE)--Dolby Laboratories, Inc. (NYSE:DLB) and Amazon (NYSE:AMZN) today announced that the second season of the hit Amazon® Original Series Bosch and a slate of blockbuster films are now available in Dolby Vision™ High Dynamic Range (HDR) on Amazon Video. U.S. customers can now watch titles available in Dolby Vision via the Amazon Video app on compatible Dolby Vision enabled smart TVs. Amazon Video joins a growing number of streaming service providers that currently support Dolby Vision. 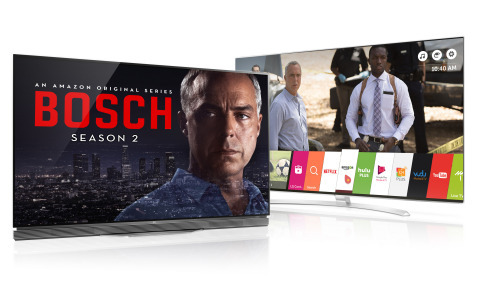 The first Dolby Vision titles that are available today on Amazon Video include the second season of the Amazon Original Series Bosch—the hour long drama based on Michael Connelly’s internationally best-selling Harry Bosch book series. Amazon Prime® members can watch Bosch in Dolby Vision at no additional cost to their membership. In addition, Hollywood favorites from Sony Pictures Home Entertainment: The Smurfs 2, After Earth, Men in Black 3, Hancock, Salt, Pineapple Express, Fury, The Amazing Spider-Man 2, Chappie and Elysium are available to purchase in Dolby Vision for all customers on Amazon Video. From content creation to distribution and playback, Dolby Vision has support as an end-to-end solution from A-list Hollywood directors, executives at major studios, OTT service providers, TV manufacturers, and operators worldwide.